Are you responsible for the management of one or many empty, void or vacant properties? If so, you know how difficult it is to ensure that they do not deteriorate or get damaged within reasonable budgetary constraints. Nationwide, Advance Guarding can protect your void or vacant property from all forms of damage including fire, flood, theft, vandalism, graffiti and illegal occupation. Not only do landlords with empty properties lose out on rental income, they may pay increased insurance premiums, and substantial repair bills if the property is broken into and vandalised. And you cannot keep an eye on your empty property portfolio all the time. Let Advance Guarding become your eyes and ears when your property is vacant through our range of physical and electronic security such as monitored alarms and CCTV to support your specialist needs. New laws prohibit squatters from entering empty residential property but no such law exists for commercial property. Advance Guarding has enormous experience in the protection of void and vacant properties. These buildings, being so susceptible to squatting and vandalism, require just a little investment of time and money and we can put up a strong deterrent to these criminals. What is usually required is a mixture of boarding up to ensure a secure perimeter, regular Security Patrols, which will also monitor meter readings, water leaks, roof leaks, etc and monitored, battery powered, CCTV with alarm response which ensures the best protection for the best value. Bear in mind that most insurance companies stipulate that property owners and landlords will lose the right to indemnity or payment for any claim if they have failed to fulfil the conditions of their insurance cover for unoccupied buildings and that generally, buildings must be decommissioned within 28 to 30 days of appointment or un-occupancy. Advance Guarding follow and satisfy the Void Property requirements of the UK’s largest insurance underwriters and our nationwide team of mobile Property Inspectors make regular visits to many properties to monitor and document their state of preservation. Advance Guarding are always there to ensure owners and landlords’ investments up and down the country are protected. 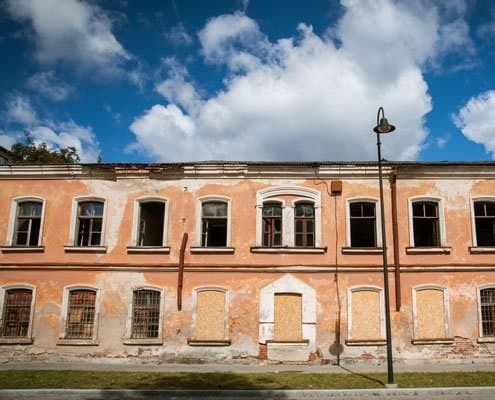 Whether your void property is a Hotel, Residential Home, Commercial Premises, Factory or even a listed building, our Void Property Team work in all types of properties and can solve all vacant property problems. There is nothing our team of experts can’t handle. In general, void, vacant and empty mean the same thing. An unused and possibly redundant property that does not have a current authorised tenant, is left vacant while downsizing or is occupied by squatters or other unauthorised occupants. In exceptional cases and following a squatter invasion, our team of operatives have cleared human excrement, disinfected whole floors and grounds, removed piles of waste material and left the property ready to show potential clients – and all within a couple of days.